All purpose all weather metal preservative. Regular use eliminates constant cleaning and polishing. Sure protection against pitting and oxidation. Non greasy, non staining, invisible shield. Does not attract dust or dirt. Easy to wipe on -- needs no rubbing. Absorbs and reduces the appearance of fingerprints. Each fresh application removes the prior one. Cleans, but does not break down lacquered finishes. Leaves metal bright and clean with a protective shield that cannot be detected by the eye or noticeable to the touch. 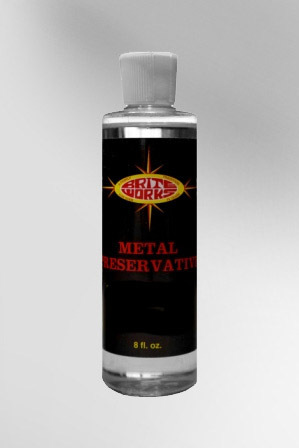 A perfect cleaner and preservative for plated finishes. No gloves or mask needed, hardly a trace of odor. This preservative is not hazardous and does not have to be shipped under a hazardous label. Cleans and polishes brass, bronze, copper, chrome, nickel, silver, aluminum, stainless steel and polished steel. Removes rust, tarnish and stains. Harmless to skin and clothing, you do not have to wear gloves. Quick results without hard rubbing. Does not contaminate metal with heavy acid base. No harsh abrasives -will not scratch smooth surfaces. Less rubbing using pre-soaking methods, -do not allow to dry on metal surface. Leaves no residue to turn green. Chemically cleans metal surface before lacquering. Very little chemical odor, a mask is not needed. You can clean and polish all metals twice as fast using less polish. 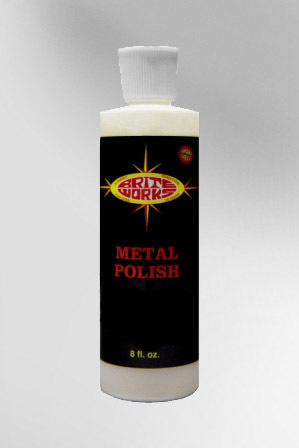 Briteworks metal polish will draw out acid and other contaminates from the pores of the metal left from previous cleaners. This polish is not flammable and will not ignite under open flame. This polish is not hazardous and does not have to be shipped under a hazardous label. NOTE: This product will not remove pits or scratches! Used in conjunction with 3M Scotch Brite, hand pads, pits and surface scratches can be eliminated.